Preheat the oven to 450 degrees F. Combine the rosemary, garlic and cayenne in a small bowl. Add enough olive oil until it becomes a loose paste. Schmear the roast with the rosemary-garlic paste and really massage it into the meat. Season generously with salt. Put the onion, carrots, celery and mushrooms in the bottom of a roasting pan. Toss with a little olive oil and salt to taste.Add the wine, 1 cup chicken stock and thebay leaves. Put the roast on top of the veggies; roast until the meat is really brown and lovely, about 45 minutes. 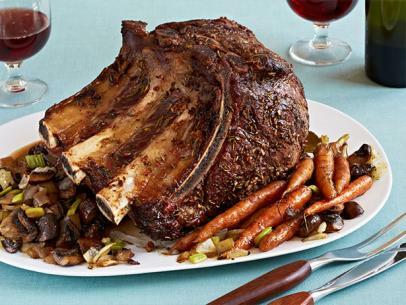 Reduce the oven temperature to 350 degrees F; continue roasting, rotating the pan halfway through, until an instant-read thermometer inserted into the center of the meat reads 125 degrees F for medium rare or 130 degrees F for medium, another 2 hours 20 minutes. During the roasting time, occasionally spoon some of the pan juices over the meat. If the liquid level in the pan goes down too much, add the remaining 1 cup stock. 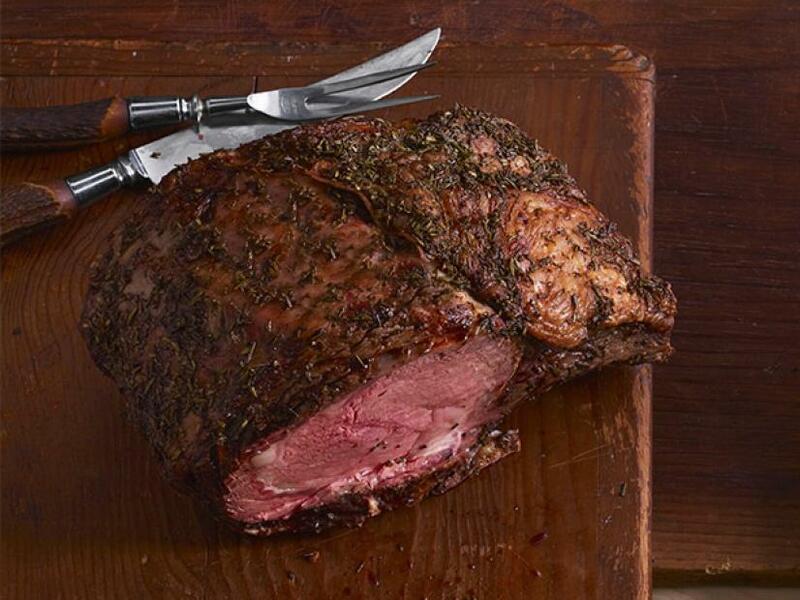 Remove the roast from the oven and transfer to a cutting board. Let rest 15 to 20 minutes before carving. Taste the veggies and season with salt, if needed. Skim off any excess fat from the pan juices and remove the bay leaves. Slice the roast and serve with the veggies.